We know that we have to quickly and drastically reduce the emissions of greenhouse gases into the atmosphere if we want our children to lead a quality life. With quick I mean quick, i.e. within a few years, and with drastically I mean drastically, i.e. down to just 5-10% of present values. Still, on the political agenda, we see only tiny steps rather than a bold vision that would instill hope in our societies. One topic that keeps me wondering is heat-pump systems. Should the replacement of fossil-fuel-based hot water and space heating systems be a top priority? Should countries implement a roadmap of increasing punitive taxes on all fossil-fuel heaters (boilers, US-English: furnaces, etc. ), which can be replaced by heat-pump systems? Should the latter be strongly subsidized? Intuitively, this seems to make a lot of sense – at least in countries like Germany with a large number of fossil-fuel heating systems and relatively low penetration of air-conditioning. Hot water and space heating is a substantial fraction of greenhouse gas production, and even a simple ambient-air heat-pump can save a lot of energy (see Appendix below). At the same time, the switch-over to electrical heating is necessary to increase the potential future use of renewable energy sources. As a result of electricity being increasingly generated from renewable energy, a 2013 study concludes that in 2030 an average heat-pump system will save 80% of greenhouse gases compared with an efficient state-of-the-art fossil fuel based system (cited in Appendix). Even when allowing for some doubt regarding the exactness of 80%: This is much higher than the average effect of retrofitting building insulation. The latter, however, appears to be the dominant activity and dominate the discussion. I am wondering for a while now: Why is retrofitting buildings with heat-pumps not a big topic in the climate debate? It plots the long-term costs of CO2-saving measures on the y-axis (negative cost indicates long-term savings after an initial investment), and, ordering them by cost, plots the cumulative reduction potential for greenhouse gases on the x-axis. Only options up to 60 €/tCO2eq are shown, leading to a total potential of 38 Giga-tonnes CO2eq. The graph comes from a McKinsey study, which is available here. Similarly, the excellent study by Volker Quaschning 2016: “Sektorenkopplung durch die Energiewende. Anforderungen an den Ausbau erneuerbarer Energien zum Erreichen der Pariser Klimaschutzziele unter Berücksichtigung der Sektorkopplung” supports the conclusion that retrofitting heat pump systems should be a top climate priority. It states (my translations): “With respect to heating, not new gas- or oil heating, or combined heat and power systems may be installed after 2020. The majority of space heating will be supplied by heat pumps.” and “even if not building insulation would occur, but all space heating retrofitted with heat pump systems with a COP of 3, the additional electrical energy for heating would drop from 770 TWh to 167 TWh.” (167/770= 21.7%; original German text: “Im Wärmebereich dürfen ab dem Jahr 2020 keine neuen Gas- oder Ölheizungen sowie KWK-Anlagen installiert werden. Aus Effizienzgründen wird künftig der überwiegende Anteil der Raumwärme durch Wärmepumpen gedeckt” and “Würden keinerlei Gebäude saniert werden, aber alle Wärmeversorgungssysteme durch Elektro-Wärmepumpen mit … einer Jahresarbeitszahl (JAZ) von 3 ersetzt, sinkt der zusätzliche Strombedarf von 770 TWh auf 167 TWh”). 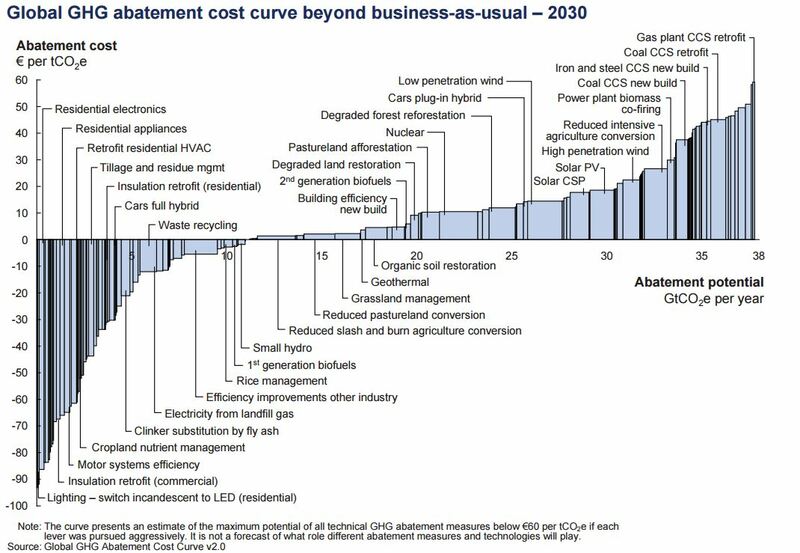 So, why is retrofitting the existing fossil-fuel-based hot water and space heating systems with heat-pump systems not a top climate action priority? Is this the typical political inaction? Lobbyism? PS 1 (Update 2017-09-07): The summary of the energy scenario of German BMWi 2017 states: “So setzt ein sinnvoller Einsatz von Wärmepumpen voraus, dass die Gebäude gut gedämmt sind.” (= “a condition for a meaningful deployment of heat-pumps is, that the buildings are well insulated”), and “In bestehenden Gebäuden senken energetische Sanierungen nicht nur den Energiebedarf, sondern ermöglichen in vielen Fällen erst eine emissionsarme Wärmeversorgung, z. B. durch Wärmepumpen.” (= “retrofitting activities in existing building not only reduce energy consumption – in many cases they are a prerequisite for low-emission heating solutions, e.g. by means of heat pumps”). I can understand that this may be the case for very poorly insulated houses (> 200 kWh/m²a ? ), but it appears to me rather overgeneralized, reflecting past decision processes based on a fossil-fuel heating system. The same report, however, correctly warns to avoid replacing fossil-fuel heating with slightly more efficient fossil-fuel heating (p. 8, original German text: “In einigen Bereichen existieren „low hanging fruits“, die schnell eine deutliche Reduktion der Emissionen bewirken, langfristig aber nicht zielführend sind. Beispielsweise vermeidet eine moderate energetische Sanierung eines Gebäudes mit dem Tausch der bestehenden Ölheizung gegen eine Gastherme zunächst fossilen Energieverbrauch und Emissionen; für das langfristige Ziel können jedoch eine sehr ambitionierte Sanierung sowie der Anschluss an ein Nah- oder Fernwärmenetz erforderlich sein. In vielen Fällen dürfte eine einmal durchgeführte Sanierung dazu führen, dass eine erneute, bessere Sanierung erst Jahrzehnte später erfolgt.”). PS 2. An important connection exists between heating, decarbonization of the energy system, and energy storage: I believe if we introduce a combination of taxes and market incentives, one component should be to incentivize the – compare to battery-electric storage – cheap thermal storage possible with heat-pump systems. There should be a provision that new systems must provide heat storage for 1-2 days, to plan for the decarbonized, wind- and photovoltaic-based future energy system. How important is space heating (and hot water generation) from fossil fuels in Germany? 1. Overall, heating and cooling accounts for 50% of Final Energy Consumption in Germany (including process heat). 2. From Table 6.3, Energiebilanz Deutschland, Stand 07/2016 I calculate for 2016 that the residential, commerce, services sector, without transportation and factories (i.e. largely without process heat), consumed 2202 PJ final energy from direct use of fossil fuels (2016 values, coal incl.brown coal 32, gas 1406, oil 764, total final energy in sector is 3874, total final energy in Germany is 9152). For comparison, the values only for private residences is 1448 PJ (coal incl.brown coal 28, gas 956, oil 464). Given that transportation and industry/factories are excluded, I believe it is safe to conclude that the vast majority of this direct use of coal, oil, gas in the residential sector relates to low-temperature heating and cooking purposes – the occasional blacksmith craftsman excluded. That is from these data, 24% of final energy go into fossil-fuel-based room-heating, generating hot water and cooking (additional fossil-fuel goes into current electricity production, part of which is used for heating purposes again). 3. Similar data can be obtained for 2015 from Table 6 and 6a of Energiedaten: Gesamtausgabe des BMWi. According to Table 7, space heating is 27.1%, hot water 4.6% (sum 31.7%) of final energy for all sectors and all energy sources together. 4. According to a presentation by H.-W. Sinn of the IFO Institute, in 2012 31.4% of current fossil fuel in Germany (26.4% of final energy) was used for residential/commercial space heating & hot water generation (any better source for this value?). 5. A web page by a heat-pump industry association (accessed 2017-08) states that space heating and hot water generation are responsible for 40% of German CO2 emissions and that 90% of all space heating systems are still using fossil fuels (oil and gas). 6. Further, the heat-pump industry association website cites a 2013 study by the Tech. Univ. Munich which concludes that in 2030, an average heat-pump system will save 80% of greenhouse gases compared with a state-of-the-art fossil fuel based system (assuming that the proportion of renewables in electricity generation increases in 2030). Heat-Pumps: In general, the energy savings of current heat-pump systems depend on the type and amount of investment (using ambient air, soil, water, heat buffer, geothermal). The annual average Coefficient of Performance (COP) of heat-pump systems lies between 2 (50% saved) and 6 (83% saved, e.g., for a geothermal system). Next War may give us hope — German: Krieg als Quelle der Hoffnung?